So, as it has been announced a few months ago, Momoclo are one of the music guests of this year's Japan Expo, a festival dedicated to Japanese culture which takes place every year near Paris, in Villepinte! Actually, this year, JE lasts from July 5th to 8th, but Momoclo will be there only on July 5th and 6th. ♥ Signing session by draw, from 1:30pm to 2:30pm in Signing room 2. I have created this topic to talk about the event and to post all the media regarding it, and eventually my own photos/videos if they are allowed! I won't be able to welcome them at the airport, but I'm pretty sure we will have news about their flight and arriving in Paris in less than a week! Ok so we got new informations on the last week! I don't know why we know it officially, anyway the Friday surprise event is actually "Sailor Moon" manga 20-year birthday. It is in partnership with Kodansha because Sailor Moon is edited by this publishing house. They also mention a "new project". What is written: "Momoiro Clover Z are celebrating Sailor Moon 20 years. Launch of a new project on the occasion of the 20 years of its creation." Next to the Momoclo pic: "Paris-Tokyo live link! Global announcement of the project during Momoiro Clover Z concert at Japan Expo !!" And another important news! The main events will be live broadcasted on NicoNico Douga! D-2, almost D-1! 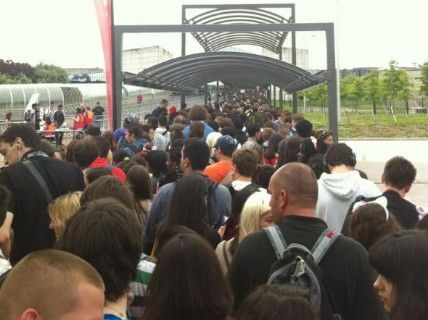 Sure tomorrow they will be in France! EDIT: By the way, Momoka killed me by writing a post called "Bonne nuit !" (French for Good night!). She's amazing. They are coming!!! It's cool that they'll stream the live, can't wait. Yay live stream! Awesome! Have lots of fun and report back! BTW the Girl's Factory show mentioned on Momoka's blog looks interesting. They are on the same bill with miwa, Ieiri Leo...and Goto Mariko (ex-Midori)! Don't know what Goto Mariko is up to these days but I'm betting on something crazy. Hope this gets uploaded. I couldn't go to the airport to welcome them. However, the Japanese fashion model Aoyagi Fumiko posted yesterday on her blog photos of French fans (yup, looks like they were at the aiport very early xD)! She wrote she came to Paris for her job, and when she went out of the Charles de Gaulle airport gate, she heard someone shouting "Ariyasu Momokaaaaa ! or Shioriiiin !". 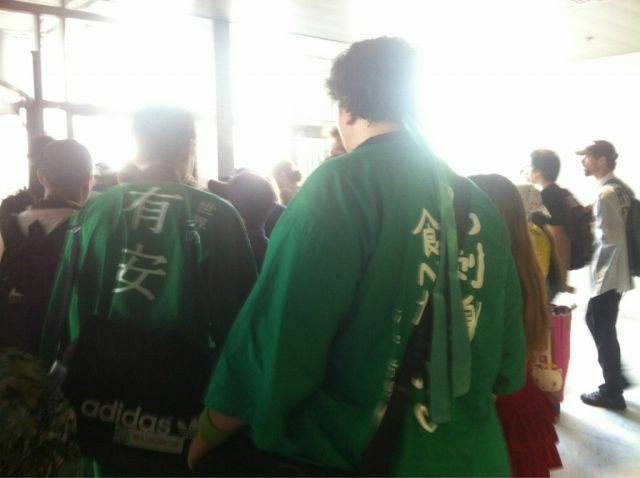 She asked them and they told her they were French Mononofu waiting for Momoclo. 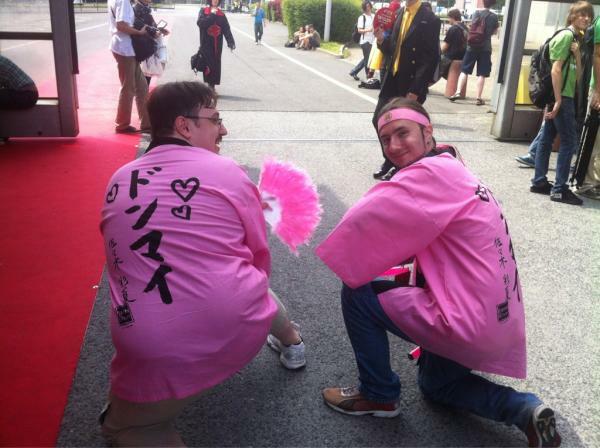 EDIT: another photo on Japan Expo Twitter. 2ND EDIT: A video of their arrival! I wish I can give my present to Momoka like this tomorrow! And here I go to adventure~ I'm so excited!! Hi I'm a french fan of Momoiro Clover Z and today we welcomed the girls at Paris's airport. They were a lot of fans (about 50). They were a lot of french fans of course but also japanese fans. Momoclo are soo cute in real life /love Momoka is my favorite one and she looks so tiny lol ! /love2 I hope you'll enjoy it. And thanks Shadox for sharing the video, I moved your post here, because it's better to have it on one thread. Too short and Nico video is too crowded. No time to write anything now, just that there is no words to describe how it was. I could have a ticket for the signing thanks to my lucky star and an angel's kindness. The showcases were amazing, mostly the 2nd one. I was near the stage for both of them. Complete report tomorrow evening France time! Was the japanese side of the conversation streamed as well? Cause the lag and echo are annoying. Must have been set up by idiots. Also I don't understand a word of French. I think not, that's all we have right now .. too bad ..
Just got back to England, I missed their first live on Thursday, but caught the other two performances. Definitely was well worth going for, even bumped into Kawakami-san when they were getting ready for the Sailor Moon performance. :D Also great to see you got the videos up on youtube so quickly already. Sorry everyone, I said I'd post it yesterday but I didn't know I'd write so much xD It's very long, sorry ;__; Photos will come later! There are no words to describe how it was. More than amazing, more than incredible, more than exceptionnal. When we arrived on the morning with a Shiori fan friend, we hurry up to go to the draw for signing session. The feeling I had while I was in the queue was horrible, I was soooo stressed, but I was believing. My friend picked a paper, she won. Now it was my turn, I picked a paper too. Perdu. LOST. My head was empty and I immediately started to cry hard. I was very ridiculous xD But I couldn't stop ;__; While crying, I went to see my other Momoka fan friend who was after me in the queue. She was with a guy an adorable Japanese girl (also a Momoka fan \o/) she just met, who told me I could come to Japan to see Momoclo later. Little by little, I started to calm down. When came their turn, all won but the Japanese girl. 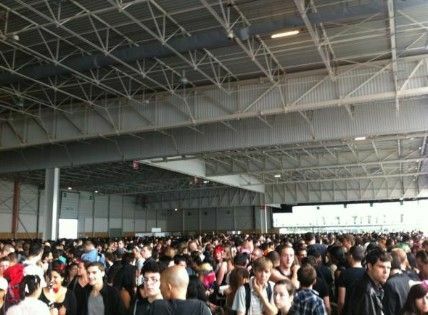 Then we decided to join the queue for the first showcase. As we were leaving the signing place, a guy came to me and tendered me a ticket for the signing. I was like "eeeeeeeeeeeh" and at first I didn't understand xD He said he give me it because he saw I wanted one. I couldn't do nothing but thanks him a thousand of times and hug him! He's my angel ;____; Thank you guy! We went to the queue for the showcase, and here we had so much fun! We talked with the fans, took photos, sang, etc! 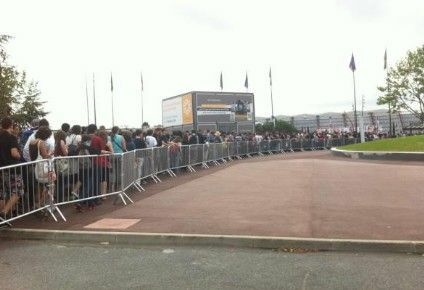 By the way, we had the feeling we were the only French in our "area" xD There were really LOTS of fans from Japan. And they gave us photos ;__; Thet were so nice and funny! Finally we entered the venue, there were seats but during the concert we were all standing of course! It was sooooooooo amazing, I was in the 3rd row, in the middle! (well, still a little far from the stage because it was one like for fashion shows). I wished they sing Wani to Shampoo and it was the 1st song! It took me a few seconds to realize it, haha. We jumped like crazy! Otome Sensou was epic too, and thanks to this live now I love Chai Maxx! We shouted for the encore but they didn’t came back. The 1st one was Momoka. She was the one for whom I wanted to have a ticket. I gave her the photobook. I remember that she said my green T-shirt was great and that I said thousand of times "daisuki desu!" and... wow. I told her seeing she had wrote “Bonne nuit!” on her blog made me so happy and she was like “waaaah I’m glad! You read my blog!” haha. When the manager told me to hurry up, I said she was my no.1 and I will love her forever. For Aarin and Kanako, I have little difficulties for remembering. I said "Aa~~rin!" and her reaction was soooo cute. I told her she was cute. Since I talked in Japanese, she said my Japanese was great and I answered, I'm studying it. She was impressed and put her inch up. And... Momoka was busy with no one so she also said "woooo~" and at that moment I realized I forgot to gave her my present! My preseeent! Happily I was able to give her it saying I was sorry and I forgot it xD The manager and Momoka and Aarin were laughing hard. And came Kanako. Well, I remember she said my Japanese was nice and surely a few other things but I forgot. Sorry! Reni was the last. I didn't know what to say so I asked how she was and she answered she was "genki!" with her fists raised ^^ And I said me too and then I had to gooooo. I will never forget this. Never. While the signing session continued, I realized I was so much into talking to them and enjoying at the maximum that forgot to tell them my name. I regret it a little bit now, but I prefer that than forgetting to give her present to Momoka xD Around 15min before they left, they got up and came where we were waiting for our turn. Medias took photos. As to me, I had a paper with "Momoka" written in hiragana and roman and the manager showed it to her and she was like "wooooooooow hellooooooo" shaking her hands with a big smile on her face ;_____; This was an unforgettable moment too. And the time came to take part in the queue for the second live. We ate all together and had fun. Once again I was in 3rd row! I was seeing the stage very well. Before Momoclo, there was another showcase and we did our best to cheer as much as possible the artists Kohei Tanaka and Junko Iwai (who was incredibly beautiful). And then it began… Oh wait, this music… La Marseillaise ??!!!! (French antem). We were all like “wtf!!!??? ?” xD But as to me I was proud and so grateful they decided to play it so I sang powerfully. It was fun! And then the show began with CONTRADICTION. Waaah. After a few songs they introduced themselves with their catchphrases! We were all happy because they didn’t make it in the 1st live! They even concluded their introductions in French! I was going to die because of their cuteness! It seems Aarin wanted to say Momoka’s part xD And we sang (badly, haha xD) happy birthday to Kanako! She was surprised and happy! Momoka was JUST in front of me and I’m SURE she recognized me and stared at me for a long moment, and each time I was smiling to her she smiled to me too, and we made signs to each other and wow. During the whole concert. I don’t remember the songs in order but the ones I enjoyed the most were D’ no Junjou (since I know this song I dreamt of shouting “DASSHU DASSHU DASSHU DASSHU DASSHU DASSHU DASSHU DASSHU” xD), Mouretsu (with the glowsticks it’s epic when you do the “MOURETSU!” movement and also I wanted to shout “Ai ai saa!”), Roudou Sanka (making the “OI!” while jumping during the chorus is super fun), Chai Maxx (this time I enjoyed it fully because remember, I love it now xD) and of course, Momoclo no Nippon Banzai! The live ended with this song and it was wonderful! It was done, they did sing my 3 favorite songs! I was soooooooo glad! And it ends. We also asked for a return of the girls but the result was the same as in the morning. I never sweated like this. Even for Morning Musume., my favourite group, I didn’t give myself that much in shouting wotagei and jumping and waving my glowstick. That was at this moment I realized Momusu. wasn’t my only favourite group anymore. Going back to home, so much memories and happiness inside me. Tomorrow would be great too. On Friday, there was only the surprise event with Sailor Moon. So we directly went to the queue and waited, and like the precedent day, we took photos with the fans and talked with them, they gave us photos (they ask you who is your favourite girl, you say “Momoka” and they take their photo album and pick up all Momoka photos for you. I’m not kidding, a Kanako fan really gave me all his Momoka pics. I didn’t know what to do but thank them in Japanese and show my happiness). We entered the venue and at first attended Professeur Sakamoto showcase, musician playing video games music. It was funny! After that, we all prepared for the last event of Momoclo (T___________T). There were French fans in front of and next to us. One of them, about the same height as us, moved out of line so that we see the stage well, even if we didn’t need it but he was so nice, we were with him at Thursday 2nd live too (we were like “eeeeh you again?” xD). The other heighted about 1m90 and we are only ~1m60, and we gently asked him to move out a little and he didn’t accept even if, wherever he stands in the venue, he can see the stage perfectly (ah yes, we needed a selfish fan, we saw no one like him since Thursday, we were missing it --‘). This made me a little angry but we managed to see the stage a little better by squeezing (yet we were in 3rd row). We started to shout their names like the other times and I gave all my soul for Momoka because I won’t be able to do it for a long time after this. When we were out of the venue I had tears in my eyes. Already over. But surely, those 2 days, and especially Thursday, were ones of the best in my life. I was so happy. Plus, once again, a fan gave us a Roudou Sanka CD and a giant poster! Awwww. We spent the rest of the day walking in Japan Expo with a Reni-chan Japanese fan so kind and funny! When it was time to go home I hugged everyone xD and in the train I was crying of happiness looking at the presents, remembering all what happened and thanking in my heart all the persons I had met. They were incredible. Amazing. I didn’t imagine it would be so great before. It’s the first time I attend an idol event and I have almost no regret after. The videos don’t say anything about a live atmosphere. And I have met so many nice people and made lots of friends. Thank you everyone. Thank you guys who gave me all the Momoclo and Momoka things. Thank you unknown angel who gave me the ticket for the signing session. Thank you to all the persons I have met. I’m so blessed. I will never forget you. I knew Momoka got my present since I gave her it myself. I hope she will remembering me, maybe as the curly-haired girl who forgot to give her it at first xD I hope she will put the donkey plush in her room or sleep with it, holding it tightly, and I hope she will wear the hair accessories. I hope she will laugh looking at the drawing and she will be happy reading the letter surely full of mistakes xD And I hope we meet again someday. We have to. Momoclo gained an even bigger place in my heart. I will love them forever. Thank you girls!